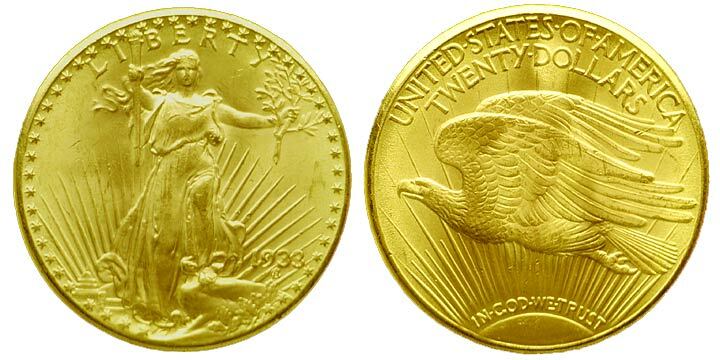 The $20 gold coin shown here is the only known specimen of its kind and is among the rarest of United States coins. It owes its existence,in part, to the discovery of gold in California in 1848, of which the famous Sutter's Mill discovery was but the beginning. The California Gold Rush created a steady flow of gold, part of which reached the United States Mint in Philadelphia. Instead of striking gold in traditional $10 pieces,the Mint decided to also issue larger denominations. In February 1849,Congress authorized the striking of $20 gold coins, which were created by the very talented Chief-Engraver James Barton Longacre. This coin is one of two trial patterns struck on March 12, 1850, even though it bears the date 1849. The second pattern has never been found. This coin inaugurated the series of gold 20 dollars, nicknamed "double eagles", which were issued from 1850 to 1907. 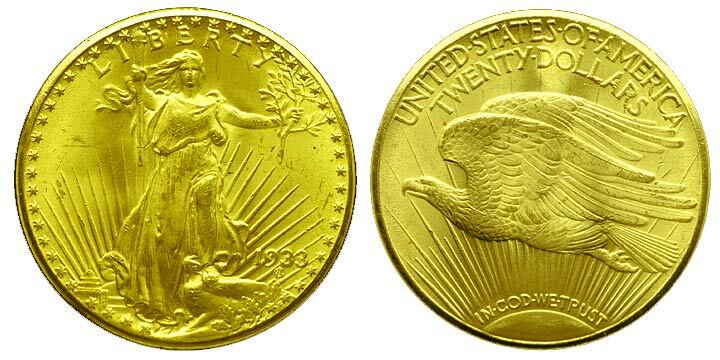 The term "double eagle" is derived from the fact that the $10 coin is called an "eagle". The experimental high-relief $20 coin struck on December 22, 1907 was the work of two famous Americans: President Theodore Roosevelt and sculptor Augustus Saint-Gaudens. The President was a great admirer of ancient Greek coins and wanted to bring similar beauty to the U.S. coinage. He approached Saint-Gaudens to redesign the 10 and the 20 dollar coins. For the $20 the sculptor chose an advancing figure of Liberty for the obverse and a flying eagle on the reverse. Chief-Engraver of the U.S. Mint, Charles Barber, resented the new design, partly because the high relief of the coin required a longer striking process, thus only a few of the very high relief pieces were struck in December, 1907. Soon afterwards new dies with a much lower relief were created for this coin; it was issued for circulation from 1907to 1933. The coin above shows the ultra-high relief. It was a gift from Saint-Gaudens to President Roosevelt. In 1967, this piece was donated to the National Numismatic Collection by Cornelius van Schaak Roosevelt, a nephew of the President. These two 20 dollar gold coins were set aside from the rest of the 455,500 double eagles struck in the spring of 1933 but never released for circulation. They are part of the National Numismatic Collection and are currently on display in the "Money and Medals Hall" on the third floor of the National Museum of American History. The financial instability following World War I through-out the world encouraged many private citizens to hoard gold, ultimately also affecting the U.S. gold reserves. The problem was compounded in the 1930's by a general bank crisis that led, on March 6 to 9, to the closing of all Banks. President Franklin D. Roosevelt succeeded with his legislation "the Emergency Bank Relief Act" of March 9, 1933 and the "Gold Reserve Act" of Jan. 1934, in putting an end to these crises: banks were opened, but gold vanished. 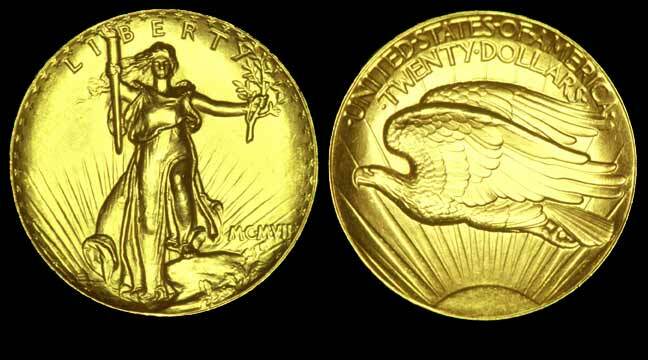 The legislation put an end to all circulation and private possession of U.S. gold; an exemption was granted for "gold coins having a recognized value to collectors of rare and unusual coins". Late in 1934, the 1933 $20 coins were melted down, with the exception of the above two coins and a small number of other specimens, including the recently auctioned King Farouk specimen. The two coins pictured above were added to the National Numismatic Collection on October 9, 1934.